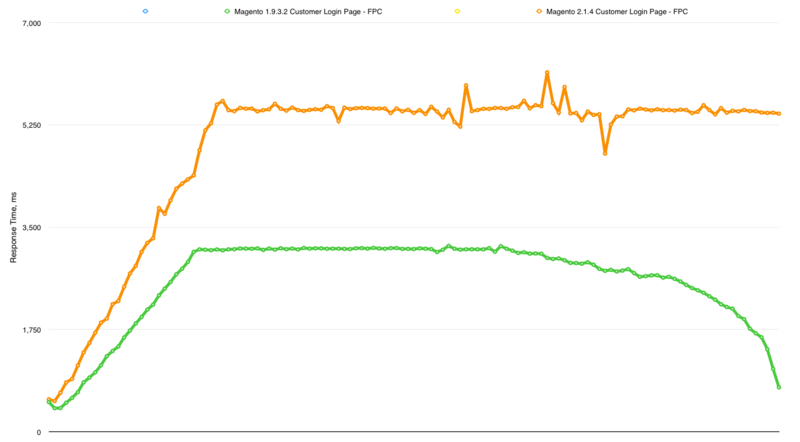 Today I will see what is faster: Magento CE 1.9 or Magento CE 2.1. I was inspired by this StackExchange question and by the Amasty team benchmark. Amasty compared Magento 1.9.2.2 vs Magento 2.0.0. They found out that 1.9 is faster than 2.0. Now it is 2017 and Magento 2.1.4 and 1.9.3.2 just came out so I decided to see if 1.9 still beats 2.1. Disclaimer: I will be comparing Community Editions (CE). 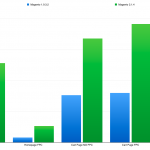 I am aware that Magento released the official Magento 2.0 Site Performance and Scalability Optimizations white paper where they show Magento Enterprise Edition (EE) 1.14.2 is slower than Magento EE 2.0. We will be talking about CE here. I don't want to wait show me results now! I will be using JMeter as load testing software. Scenario as follows: 50 concurrent users with ramp-up period of 10 seconds repeating 20 times. That comes down to 1000 requests. I will be using Mac Numbers 2D-Line chart so it will be linear extrapolation of CSV load test data. I will be testing homepage, cart page with no items and customer login page. I won't be testing product/category pages as they might be subject to theme or data difference. 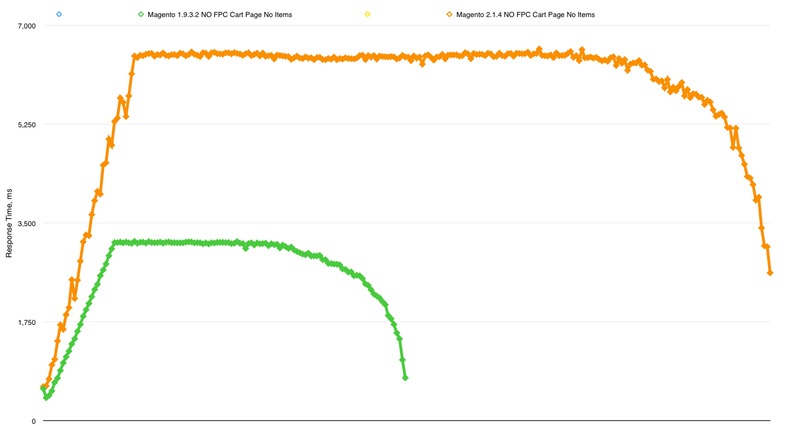 First we will test with Magento 2.1 Full Page Cache (FPC) off. 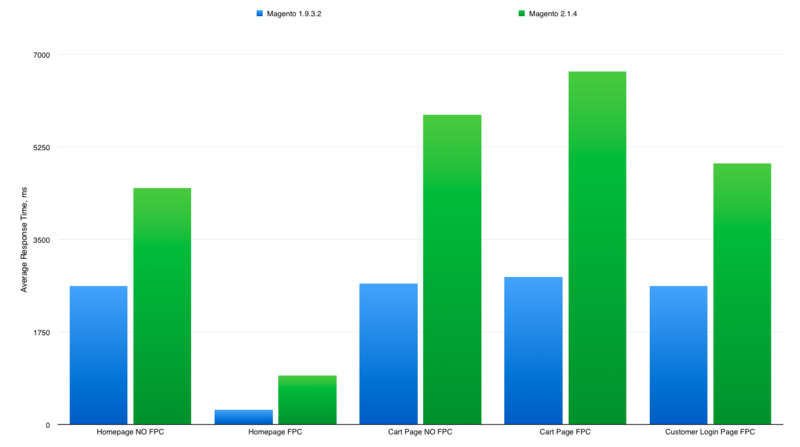 I want to make 1.9 and 2.1 even because Magento CE 1.9.x doesn't have FPC by default. No we will turn on Magento 2.1.4 FPC and will install the free Zoom FPC for Magento 1.9.3.2. Zoom FPC is an abandoned project but with a little magic you can make it work with 1.9. I will be using a built-in FPC. We see that Magento 1.9 with FPC beats Magento 2.1.4 FPC easily. Does it true for cart page? Let's see. 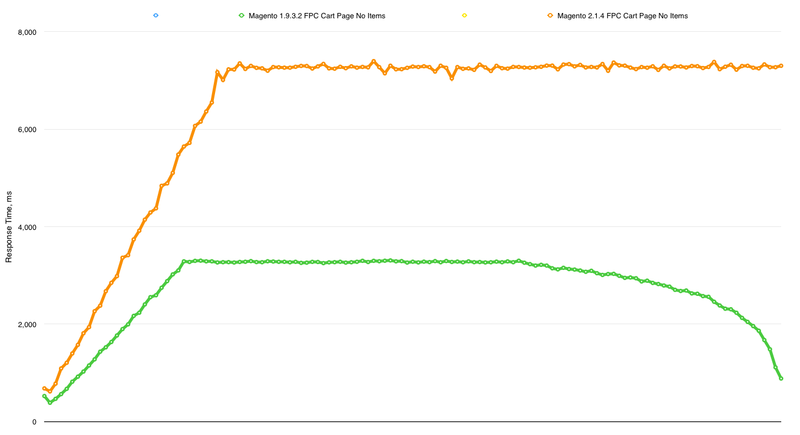 Magento 1.9.3.2 beats Magento 2.1.4 with either FPC on or off. For Magento 1.9 FPC I was using this excellent free extension Zoom FPC. Do you have a different benchmark results? Share it comments! It's my experience too! 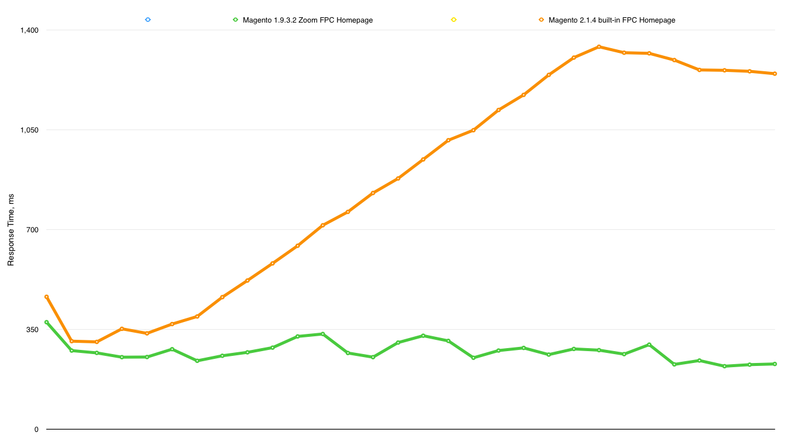 Magento 2.1.x is much slower than Magento 1.9.3.x! - Thats a fact! - I realized that by installing on my root server and checked response time! - At first I thought, that the server configuration is not optimal, but everything was perfect. 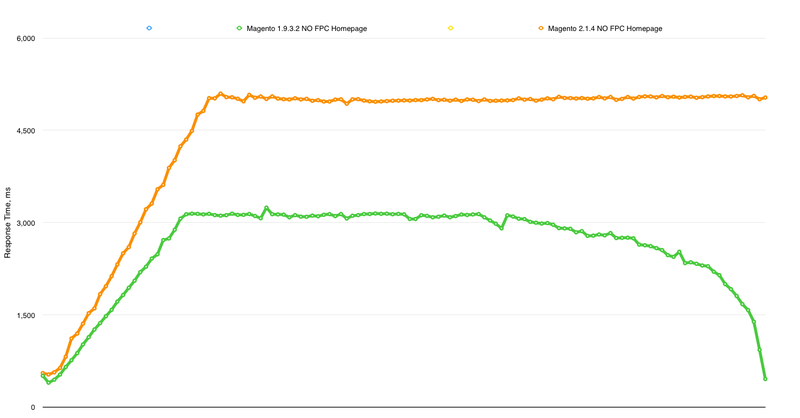 Then I compared 19.9.3.3 and 2.1.7 and it was obvious, that Magento 2.1.7 had overall twice the response time than Magento 1.9.3.3. - My conclusion is, that Magento 2.1.7 is really a cost factor, because you need more server performance to get the same response time! But this is a point, a startup my think of another shop system, that needs less recourses. What is your opinion about an alternative to Magento 2.1.x? Is there a reason you've used Zoom FPC instead of Lesli FPC which is much more popular and free as well? @developer - I explained how I get these results. You are welcome to repeat the steps I took and report the results you get. @Matt magento 2 doesn't require fpc when developing - what a non sense! I am testing TTFB - and that is the only thing that matters in my benchmark. "Both solutions tested do not indicate whether the FPC is actually working" - yes they do - just compare TTFB to the ones without FPC. Magento 2 requires Varnish Cache in production (And FPC when developing), Magento 2 isnt designed to work without a caching layer. Your tests are only requesting the HTML document (not any static assets) so you are not seeing an actual users page load and the settings around minification, combining files are not doing anything as these files are not being requested. Both solutions tested do not indicate whether the FPC is actually working, Most FPC implementations are failures as there are no metrics on what's missing cache. where does c4 come from? I am using c3 as it is stated in the article. It is also stated that i run m1 and m2 on the same aws box. I keep m1 and m2 in separate folders and with a simple nginx edit i change between them. i have done NO configuration to neither M1 nor M2. out of the box installs as I have stated. - configuration. What have you done to speed up database, php, system? For me the last is the most important. It's clear that the bottlenecks that you're seeing are outside the variables of the test.